By default content is completely closed off for users. By using rules you open up access to content. 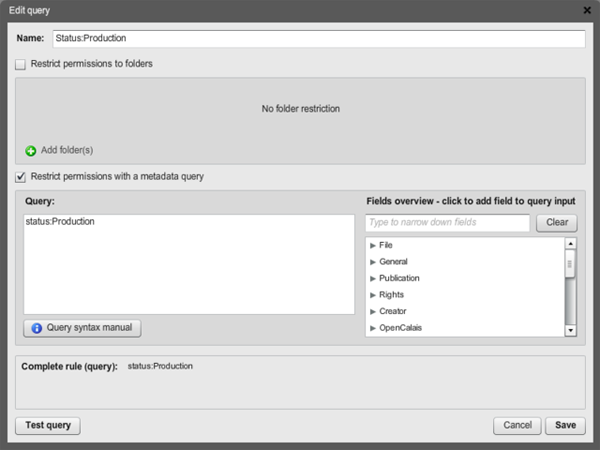 A rule allows you to manage permissions based on folder(s) or on metadata or on both folders and metadata. This means a rule can contain zero or multiple folders and can contain a metadata query. Note: Every individual rule assignment for a user opens up more content and functionality for the user. Rules can be created via System > Manage Rules. The add and edit buttons open up the rule dialog to create a new or edit an existing rule. Note: Using wildcard queries in a query for setting up a Rule is not supported: they slow down searches too much and will affect every search done on the system. Rules can be assigned via System > Manage Rules or System > Manage Permissions. A rule can be assigned to one or more users or groups. Rule permissions can be set per rule assignment, the available rule permissions are listed underneath. Note: Be careful assigning view permissions to rules that only contain a query (and no folder). 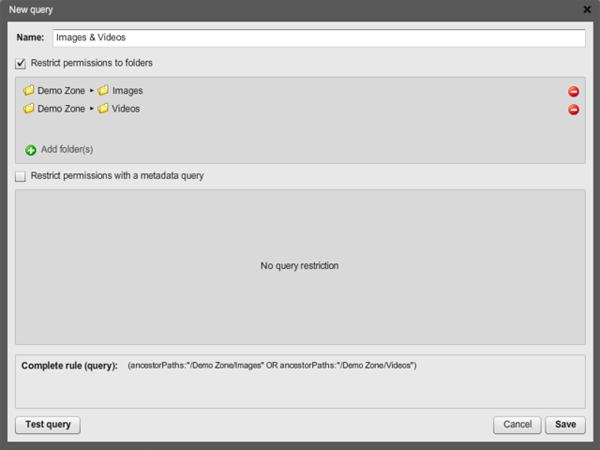 When you do this a user is allowed to view all assets, including those in other users' zones, matching the query. View Allows user to view content. View preview Allows user to view content in ‘preview’ size. Use original Allows user to view and use content in the original size, this permission is needed to be able to download, copy and check out original files as well as saving an older version in the history as a new file. Edit metadata Allows the user to edit metadata of content, like modifying data in metadata fields. Edit Allows the user to edit content with the help of check out/in, promoting versions or editing collections (like removing items from a collection) but also rotating an image. Allows user to move content, the user needs to have permission on both the source folder and the destination folder. Create Allows user to create or import content or create folders or collections in the zone. Delete Allows the user to delete content, versions of files and collections. Tip: Applying rules to users affects the time it takes to do searches and get search results. Assigning a lot of rules or complex rules to a single user(group) will impact search performance for that user(group). Note: Since Elvis 2.6 the "Move" permission became available. For backward compatibility the old way of determining move permissions is also still available, "Delete" permission in the source folder, and "Create" permission in the destination folder. Can view content in the folder "Archive"
Can view, preview and create content in the folders "Images" and "Videos"
Can view, preview and create content in the folders "Documents"